Before knowing about the difference between blood and plasma, we have to know about the transport system of a body. The system which is involved in the circulation of minerals, nutrients, oxygen, etc. for the entire body of all organisms is called as the transport system. Blood is the main element in the transport system to circulate the nutrients, minerals, oxygen, hormones, etc to all the parts of the body. It is responsible for transporting dissolved food, respiratory gases, etc. to all parts of the body. The human body constitutes of about 5 L of blood. There are different groups of blood like (A, B, AB, O). Plasma is the liquid component of the blood which is straw-yellow color. The plasma present in the blood constitutes about 55% of the total blood volume. It is considered as the single largest component of the blood in humans. it contains water, proteins, salts, minerals, enzymes, etc. The plasma is the liquid which is present in the blood after RBC, WBC, etc, are taken out from the blood. Blood is the main fluid of the body which is responsible for transporting or circulating the important and necessary nutrients, minerals, oxygen, carbon dioxide and waste products to and away from the cells in the body. 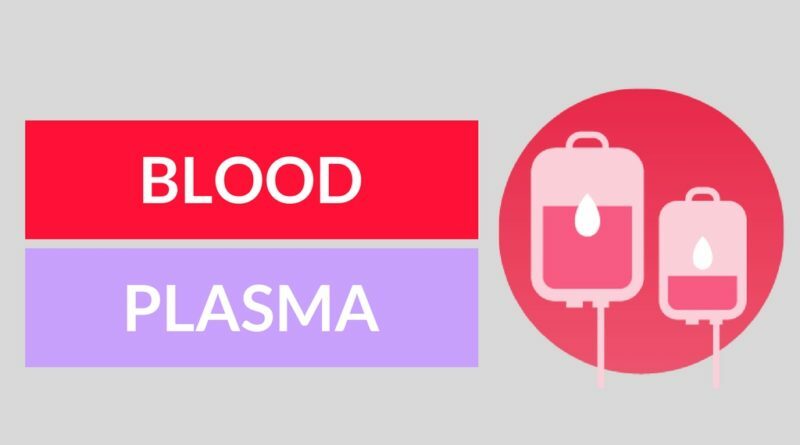 Plasma is the substance which is left in the blood after red blood cells, white blood cells and platelets are removed. It is the liquid portion of the blood and constitutes about 55% of the total volume of the blood in the body. The plasma is 90% water. Blood is composed of plasma, red blood cells, white blood cells, platelets, etc. Plasma is composed of water, proteins, nutrients, clotting factors, antigens, hormones, carbon dioxide, etc. Blood becomes solid substance and clotted after the injury. Plasma turns into serum after clotting. Serum is clear liquid which is formed after the blood is coagulated. The red blood cells, white blood cells and platelets play an important role in the circulation of blood. Plasma possess only chemical nature and there is no prominent role of cells. blood is red in color	 plasma is straw-yellow in color. blood is mainly responsible for supply of essential and necessary nutrients like amino acids, fatty acids, respiratory gases, glucose, etc to the cells in the body. Plasma is responsible for fighting the diseases, clotting of blood after the injury, etc. Donation of blood is very common and the wall blood is donated that is the blood contains red blood cells, white blood cells, plasma, platelets, etc. Donation of plasma is also possible. In this case, the blood is collected and plasma is separated from the blood and the blood is again entered back into the body of the donor. From the above discussion, it is very clear that the blood is the body fluid and the plasma is only a component in the blood. Both the blood and plasma is very important for a person to live a healthy life and donation of blood and donation of plasma are considered as Noble acts in the modern society.